Last edited by Rome_BRZ on Thu Sep 06, 2012 12:26 pm, edited 69 times in total. hmm I wonder what an exhaust would sound like in a N/A liberty like mine?? Wonder if its been done before?? Subie Boy wrote: hmm I wonder what an exhaust would sound like in a N/A liberty like mine?? Wonder if its been done before?? Hey guys listen to this 2.5 N/A, sounds pretty good to me!! I thought Liberties had similar noises to a rex? 04GT wrote: I thought Liberties had similar noises to a rex? Sorry. The MY04 - MY06 models with the 2.0 twin scroll turbo and even headers won't be able to produce that Rexy burble (ask a very annoyed Tangcla). Only the MY07 onward with the 2.5 single scroll turbo comes close, I believe due to the uneven headers. Subie Boy wrote: Hey guys listen to this 2.5 N/A, sounds pretty good to me!! Brian, in order replicate that sound you'd have to get new headers as well, just like that guy in the black socks & green Crocs. 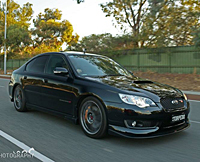 Hey, I just remembered Michael (NoOZL47) has HiTech's on his MY07 2.5i. No burble due to it being a non-turbo, but still sounds great! That is if you can hear it over his ear shattering ICE setup. I'll try and record my TbSTi when i get back to melbourne. Just interstate atm. i got a dvd with like 7 videos and exhaust clips of all these legacies back in japan. dunno where i chucked it, but if i find sometime, i'll send Arith a copy so he can rip it. great thread! Arith, is that Hitech clip of your GT just the hitechsc mufflers , cat back system or full turbo back system? TorpedoCreative wrote: great thread! Arith, is that Hitech clip of your GT just the hitechsc mufflers , cat back system or full turbo back system? Hey James, that's just the HiTech mufflers only. But I'm sure whether muffler, catback, or turbo back, it's all same same.